educate clients so they can make informed, successful decisions. Marie McCall is passionate about real estate! She prides herself on being a supportive, caring advocate with extensive experience in negotiation. A full-time REALTOR® since 1995, Marie's husband, Dave originally encouraged her to obtain her license because of her natural love of people and strong desire to help others. He had firsthand knowledge of her keen listening skills and ability to creatively problem solve. Marie also utilized her previous ten years of client service experience with a major automotive manufacturer to understand the critical importance of responsiveness and follow-through. Marie recently discovered firsthand what it means to relocate when her family packed their bags and sold their home of 27 years. Selling is so much more than obtaining a buyer, and relocating adds layers of detail and consideration to a move. She quickly realized the important role she plays in helping her clients manage the often daunting real estate process, explaining every step along the way, as well as keeping expectations and emotions balanced. 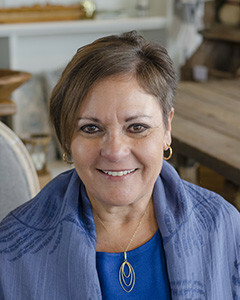 Marie is an expert on the Elmhurst and Oak Brook communities since she and her husband raised their two children there. Marie was actively involved in District 205 schools, following her children as they progressed through the school system. PTA, Junior Achievement, York Boosters, Woodside Estates Homeowner's Association, and Oak Brook Civic Association are a few organizations to which Marie devoted many volunteer hours. Ask Marie about her involvement in the Friends of Elmhurst organization that has assisted the many less fortunate families in the Back of the Yards inner city neighborhood. Proud member of Mary Queen of Heaven Parish, Marie is pleased to serve as Eucharistic Minister, Lector, CCW member, and has been a 2nd grade Religious Education teacher for 10 years. Marie's desire to be Best In Class is what drove her to the Gracik Makinney Group“ teamwork that promises first class service and expert market knowledge. Home values have changed much over the past few years; sometimes overnight! The Gracik Makinney Group combines 32+ years of experience to provide their clients up-to-the-minute market knowledge. Realistic market analysis, excellent negotiation skills, honesty, and integrity are most often cited as Marie's key differentiators. She is a Certified Negotiation Consultant, Accredited Buyer Representative, multi-million dollar producer, and was awarded @properties Driven Award and previously at Coldwell Banker as one of the top 10% sales associates in 2012 and 2013. "Another great Job by Marie. This is the second closing she has helped us with and she made the process quick and very easy. She had several great suggestions that we took advantage of."